Home > Ageing & Ear Health > Do you Have a Ruptured Eardrum? The word ‘rupture’ often creates an impression of a serious untoward medical injury in the minds of most people. The term is used medically but simply means that something is torn or has a hole in it. It is not uncommon for people to believe they have a ruptured ear drum, some even believe that an injury sustained as a child will continue to be present their whole life.For most people, the experience of rupturing an ear drum is not a long term problem and most will heal on their own. What Is A Ruptured Ear Drum? 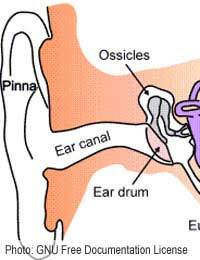 The ear drum is a small piece of membrane found in the ear and separates the outer and middle ear. Its purpose is to vibrate sound waves as they hit the membrane and pass these vibrations to delicate structures found in the inner ear.Occasionally this membrane can become damaged and a small tear or hole may appear. If the ear drum becomes damaged in such a way it may not be able to vibrate as well as it had previously and hearing loss may result. The most obvious sign that the ear drum had been damaged is to experience hearing loss. Of course all hearing loss cannot be blamed on a perforated ear drum as there are many reasons why hearing may be affected.Pain is likely to occur in most problems with the ear including a perforated ear drum. This is especially true if the rupture is caused by an infection building up or a direct injury to the ear. Pain management can include the use of warm packs to the affected side, anti-inflammatory medicine, over the counter pain killers and sometimes antibiotics if infection is persistent.The cause of the rupture may also suggest whether any other symptoms such as pain or seepage from the ear are likely. Do I Have A Perforated Ear Drum? In most cases the injury will heal by itself and cause no long term problems. If the defect does not heal without intervention and is causing no problems or noticeable hearing loss then it maybe that the ruptured ear drum is left and no further tests or treatment is necessary but if it doesn’t heal independently and is causing some degree of hearing loss or if you know you are at risk of infections (often is some employments or in swimmers), a small procedure may be needed to close the hole.A smaller procedure involves the use of special substances being placed over the hole in the eardrum to encourage healing to a slightly more invasive operation that involves the specialist surgeon closing the peroration using very small instruments. Perforated ear drums are fairly common occurrences and usually cause no long term problems and pain management can be achieved at home with no professional intervention.However if the defect does not heal by itself and continues to cause problems, it can be closed surgically. @Mosey: just read your post about your left ear roaring noise, like a helicopter.Wow!I just described what's going on for me exactly the same way to a friend...like a helicopter...also like there's heavy machinery running all around me.It happened suddenly Saturday after trying to open my clogged ears by holding my nose and blowing.Then Bam! There it was. No pain, but very frightening and disorienting. I have an appt with an ENT for Monday, but I'm afraid I perforated the eardrum.What was your outcome and cause for the roaring, helicopter noise? ?Anybody have any ideas? Approx 18 hours ago I started to have a problem with my left ear in that there was a background, soft roaring noise. This sort of thing usually goes away with 'holding' my nose and blowing hard, but not this time.It's like listening to a distant helicopter, not sore but irritating. Solution? I have had 21 perforated ear drums as a kid and the affects of it are just starting to show now that I am 15, is there any help I can get. I Am also a perforated ear drum patient. I got a lots information here. Thanks for the info. Its been 2 months that my raptured eardrum doesn't heal itself, should I wait or do operation?